“Buy More! Save More!” This is exactly the kind of marketing ploy I love falling for. I’ll absolutely spend more if you tell me I will save more! Duh. 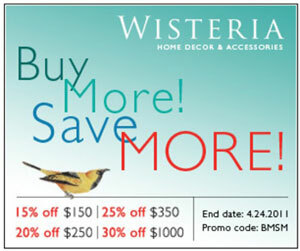 Shopping at Wisteria this month is well worth falling for this trick, though. (By the way, did you even know that the beloved home accessories store has moved even closer to us here in Dallas?) Now, you can look online to get excited about the things you want to buy in the shop, but just know, the warehouse store houses even MORE items than the catalogue contains. How’s that for incentive? Now grab your hubby’s truck, empty it us his junk, and prepare it for lovely lamps, funky furniture, and gorgeous gardening accessories. You’ll get anywhere from 15 percent to 30 percent off, depending on what you spend, and when you’re talking about spending a good chunk of change on furniture, these discounts will make a dent in the total. Woo hoo! Shop now until April 24.